Ed’s popular Clinton Casualties show aired on October 29, 2016, less than 2 weeks before Election Day. This special edition of The Main Event outlined the entire list of the alleged casualties in the “Clinton Body Count.” Whether you’re brand new to the Clinton Body Count theory or a longtime proponent, you’re bound to learn something new from this show! Click the image to hear it on demand! This is the list of “Clinton Casualties” that Ed Hoffman covered in the popular October 28, 2016 episode of The Main Event. The full episode can be heard here. If you would like to share this page, simply copy and paste the link. Shawn Lucas was the attorney found dead on his bathroom floor one month after serving the DNC with a lawsuit on behalf of Bernie Sanders supporters who alleged that the DNC and Debbie Wasserman Schultz rigged the Democratic primary for Hillary. His friends are said to be “completely freaked out” by his death because authorities refused to say how he died. A friend filmed Lucas serving the lawsuit papers at the DNC headquarters in Washington D.C. on June 28. An author of several books exposing the Clintons (the most recent of which is titled Crowning Clinton: Why Hillary Shouldn’t be in the White House) was found dead of a gunshot wound on top of a mountain near his home in Pennsylvania. Thorn had appeared on the Internet-based Russell Scott Show in 2015; here’s what Scott said after Thorn’s death. Joe Montano, a close aide to Hillary’s running mate Tim Kaine, reportedly died of a heart attack after the Wikileaks DNC email dump. He was 47. 27-year-old DNC staffer Seth Rich’s death was reported on extensively last summer, thanks to it happening right before the DNC convention. Rich was shot in the back of the head around 4 AM on July 10 in what authorities called a “robbery,” even though his wallet and cash were found on him. Some have said Rich may be the whistleblower who gave damning information on the DNC to WikiLeaks – specifically, that they sabotaged Bernie Sanders’ campaign so no one would stand in Hillary’s way. WikiLeaks founder Julian Assange hinted this was a possibility. Ashe was the president of the U.N. General Assembly in 2013 and 2014. He died in an apparent “barbell accident” with a crushed windpipe the day before he was set to testify against the DNC and Hillary Clinton. Here’s the full report from One America News. Charles Ruff, a Clinton attorney during Bill’s Lewinsky scandal and impeachment trial, reportedly “died after an accident at his Washington D.C. home.” One report said he was found unconscious outside his shower. Other reports said he had a heart attack. Miller was the VP of Alltel, the company that created the Clinton White House’s “Big Brother” data tracking system. He was found dead of a gunshot wound to the head in a shallow pit about 300 yards from his ranch house near Little Rock, Arkansas. Fox was a Marine One helicopter crewman during the Clinton administration. He was found shot in the head, and his death was declared a suicide. Lieutenant General David McCloud was Bill Clinton’s director for the Joint Chiefs of Staff Force Structure in 1996-97. He was killed while he piloted his personal aircraft in 1998. Some have speculated he was one of 24 flag officers who sought to arrest President Clinton for treason under the Uniform Code of Military Justice. Lawhorn, a mechanic, discovered a large check made out to Bill Clinton from Madison Guaranty Savings and Loan (the bank owned by Clinton friend James McDougal). The check was said to have been found in a car at his repair shop. He was later killed in a car accident. And guess who’s next on the casualty list? James McDougal, who died just two weeks earlier. Eric Butera was an informant who had information about the murder of Mary Mahoney, a White House intern who was also found dead; more on her in a moment. Butera was asked to help police with an undercover drug buy, during which he was beaten to death. Ron Brown, U.S. Secretary of Commerce, was killed in a plane crash after Hillary Clinton dispatched him on a dubious mission to a war-torn corner of Bosnia. Brown and 34 others died when their Air Force plane crashed into a Croatian mountainside. He had threatened to expose the White House’s Chinese fundraising scheme; just weeks before his death, he told friends he was scared for his life. NBC cameraman John Hillyer was investigating a drug-smuggling operation in Mena, Arkansas while Clinton was governor, and also worked on the Clinton exposé videos “Circle of Power” and “The Clinton Chronicles.” Hillyer’s filmmaking partner said that once they started interviewing people in Arkansas, they discovered the criminality and intrigue were far worse than they had imagined. “We were followed on a regular basis,” he said. When they temporarily moved in with some other journalists interested in exposing the Clintons, they discovered eight “bugs” in the house. They reported that someone tried to break in one night, and recognized the man as one of Governor Clinton’s security staff. During the filming, two of their sources were found dead before they could be interviewed. Hillyer called his partner in 1996 to say he had uncovered new information on Clinton, but they had to meet in person because he was scared. He died of a heart attack three days later. Wise was a 14-year Commerce Department staffer appointed by Reagan who stayed on through Bush and Clinton’s administrations. It’s believed she knew of illegal dealings between Bill Clinton, the Chinese government, and Ron Brown (her boss who died in a plane crash in April). After she was suspected of leaking Commerce documents exposing the scandal, she was found dead, naked and bruised from head to waist in a locked Commerce Department office. President Clinton left for an unscheduled trip to Camp David that morning. Huggins had been investigating the collapse of Madison Guaranty Savings and Loan, Jim McDougal’s bank. He died of viral pneumonia before his 300 pages of findings could be released. Shelton was the fiancée of Kathy Ferguson, the ex-wife of the Arkansas State Trooper who had been a co-defendant in the Paula Jones lawsuit (more on her in a minute). He had openly questioned whether Kathy Ferguson had actually committed suicide. He was found dead at her gravesite with a gun next to him. It was ruled a suicide. Ferguson was the ex-wife of Arkansas Trooper Danny Ferguson. Because she had escorted Paula Jones to Bill Clinton’s hotel room, she was a corroborating witness for Jones during the sexual harassment trial. She reportedly died from a suicide in which she shot herself in the head, although her packed luggage was found near her body (indicating she planned to leave home). Bunch was a Texas state employee who ran a prostitution ring from his office in Austin. He was said to have owned a “little black book” of influential people from Texas and Arkansas who visited prostitutes. Bunch’s files contained descriptions of his high-profile clients, their sexual preferences, the amount of money they were willing to spend, and whether they were “good” or “bad” clients who might hurt the escorts. There were also rumors that underage girls were working under him. He was found dead of a gunshot wound, ruled a suicide. Baugh had been an attorney for Bill Clinton’s friend Dan Lasater, who owned a ski resort in New Mexico used for drug operations and money laundering; he was sentenced to six months in prison, but was later pardoned by Clinton. He reportedly killed himself by leaping from the window of a tall building. Arkansas doctor Stanley Heard Arkansas had treated Bill Clinton’s mother, stepfather and brother and served as chairman of Clinton’s National Chiropractic Healthcare Advisory Committee. He and his attorney Steve Dickson were both killed in a plane crash near Washington DC. Dickson flew his own plane from Topeka, Kansas, but it developed problems flying over St. Louis, so they landed and rented another plane, which proved fatal. Walker was investigating the Whitewater case on behalf of Resolution Trust Corporation. He fell to his death from the top of the Lincoln Towers building in Arlington, Virginia. Jim Wilhite, vice chairman of the natural gas company ARKLA, was killed when he skied into a tree on Snowmass Mountain in Aspen, Colorado. He died less than a week after ARKLA chairman Thomas McLarty resigned to become White House Chief of Staff. Victor Raiser was the finance co-chairman of Bill Clinton’s presidential campaign and knew the Clintons for 10 years. He was killed in a plane crash along with his son and three other passengers. Grober was the White House interpreter for the deaf under Bill Clinton. She died in an auto accident with no known witnesses, with her body thrown 33 feet from the car. A very attractive woman, Paula had traveled extensively with Clinton since 1978. 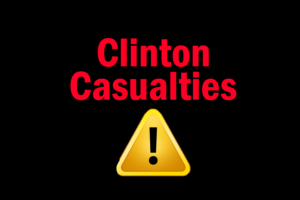 So we’ve just listed 33 people on the Clinton casualties list. Now the next several people are all believed to have been killed because they had information on the murder of the “Boys on the Tracks,” two Arkansas teenagers named Don Henry and Kevin Ives who were murdered on railroad tracks in 1987. Their families believe it was because they witnessed a cocaine drop on the tracks that was part of Bill Clinton and his friend Dan Lasater’s drug smuggling operation. Here is the list of people (all of whom knew the boys somehow or claimed to have information on the case) who were killed mysteriously over the next two years while this case was being investigated. Gibbs worked at an Arkansas bordello that blackmailed its clients with photos. According to her family, Bill Clinton was her regular customer and there were photos of them together. Her house was mysteriously burned down with her inside. In a sworn statement, Clinton bodyguard Barry Spivey said he had been with Clinton when the governor’s plane flew over her house and Clinton pointed out the house to him. Coleman, who was pregnant at the time of her death, was rumored to have had an affair with Clinton while he was Arkansas Attorney General. She was also one of Clinton’s law school students at the University of Arkansas. Though she died of a gunshot wound to the back of her head, her death was ruled a suicide. That’s 41 people, but there are at least 12 more that we know of – and all of them were bodyguards of the Clintons. About a dozen Clinton bodyguards have died over the years. Four of them – Staff Sgt. Brian Haney, Marine Sgt. Tim Sabel, Maj. William Barkley and Capt. Scott Reynolds – died May 19, 1993 when their helicopter crashed in the woods near Quantico, Virginia. The head of the fire department on the scene said, “Security was tight” and there were “lots of Marines with guns.” Those Marines seized a videotape made by a firefighter. All four men had escorted Clinton on his USS Roosevelt aircraft flight shortly before their deaths. Excerpted from The Main Event radio program with host Ed Hoffman – October 29, 2016 broadcast. Please note: This information was derived from a variety of sources on the “Clinton Casualties” theory. Although it has not been independently confirmed, there are numerous other resources on this topic available for reference.